Okay, please tell me I'm not the only one digging blindly for information on teaching Reflective Narratives to third graders. This is our first year to take the ACT Aspire test which requires third graders to produce a thoughtful reflective narrative in thirty minutes - typed! Oh my goodness. If your third graders are like mine, it's all I can do to get them to write complete sentences with capital letters and correct punctuation! Seriously, it's not all bad, but I am under some stress as I combed through TpT and every teacher blog I love and couldn't find a resource that met my needs. There are TONS of resources on writing a Personal Narrative, which is just like a Reflective Narrative, just with no reflective requirement. The problem is that if students don't choose a topic for their reflective narrative that begs to be reflected upon, they are in big trouble at the end. The other problem was that many of the personal narrative units were written over the course of four to six weeks. Since this process will have to be whittled down to 30 minutes, I can't start with six weeks. I need to get it down (at least the first one) to no more than two weeks. Lastly, the majority of the resources for a reflective narrative were written for middle and high school students (go figure). Reflection is a tough process to teach to kids this age! I decided to combine the best of all of the resources I was collecting, correlate everything to my Common Core standards, pare it down, and create a document that my third graders could actually understand. Here's what I came up with. Click on the image to see the product in my TpT store. Here's how I used the document in my classroom. 1. The first day we discussed what a personal narrative was. We completed a Patricia Polacco study in November, so I brought back out When Lightning Comes in a Jar. It's the perfect example of a reflective narrative because the story itself stops about six pages before the end of the book. As we reviewed the story, I said ".,. and so at the end, Tricia sat on the porch with her grandma and enjoyed the fire flies in the jar." Everyone nodded yes with a content smile. Then I started turning more pages... "then what's all THIS???" Kids were puzzled and looked around like, "Who added pages to that book??" I told them that this is a REFLECTIVE ENDING. I read the last few pages where Patricia Polacco reflects on the family reunion and how it serves as a way for her family to stay connected and pass down traditions through the generations. "Is that part of the STORY? or is she REFLECTING BACK on the story?" They could tell the difference. We made an anchor chart of characteristics of a Reflective Narrative that we go back to throughout the unit to evaluate other stories and THEIR stories to make sure they fit the purpose for which we are writing. 2. The next day, I used a model reflective narrative (included in the resource above) which demonstrated more of what their reflective narratives would look like. (We can't all be Patricia Polacco - can I get an Amen?) Using a model really helped my kids SEE each step of the writing process. First, we evaluated the model to be sure it was a reflective narrative based on our anchor chart. 3. We then went through each step of the document. When we dug into the prompt, I demonstrated first with the model. When we were going to write the introduction/hook, we color coded the hook in the model. When we started the plan, we looked at B, M, E and color coded them in the model. And so forth. When the students finished their draft, they went back and color coded their drafts for each part of the reflective narrative. If they were missing something, they added it in the revision step. 4. We then finished off the narrative by revising, editing, and publishing. Next week we will be typing our narratives into KidBlog to practice our keyboarding skills. I'll post more about that later. 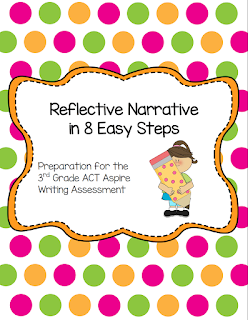 If you have Third Graders who will be taking the ACT Aspire this Spring, let me know your ideas for teaching Reflective Narrative!